In 1940s Brooklyn, New York, an accident throws Reuven Malther and Danny Saunders together. 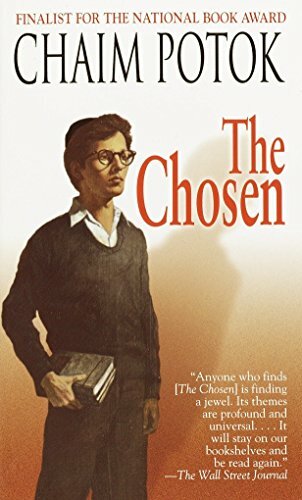 Despite their differences (Reuven is a Modern Orthodox Jew with an intellectual, Zionist father; Danny is the brilliant son and rightful heir to a Hasidic rebbe), the young men form a deep, if unlikely, friendship. Together they negotiate adolescence, family conflicts, the crisis of faith engendered when Holocaust stories begin to emerge in the U.S., loss, love, and the journey to adulthood. The intellectual and spiritual clashes between fathers, between each son and his own father, and between the two young men, provide a unique backdrop for this exploration of fathers, sons, faith, loyalty, and, ultimately, the power of love. Chaim Potok is een geweldige schrijver. Via TNT naar Fifna, die de herfstloterij heeft gewonnen. Gefeliciteerd Fifna en veel leesplezier! My goodness, a second book from miertje! Thank you very much indeed, I have read a few by Potok, and really enjoyed them, but I haven't read this one yet. Looking forward to it! Edit 17/03/12: And it didn't disappoint. A truly wonderful story, I very much enjoyed it. Taking it to the meet-up. Een Potok kan ik niet laten liggen. Mee naar huis en deze gaat in mijn permanente collectie. Ik had het boek al eerder eens gelezen in het Nederlands en wil het graag nog eens lezen; nu dus de engelse versie. On a roadtrip in Europe and many bookcrossing books will be released. This book is released in Zeltweg in the Sporthall where I am visiting the Geocaching Mega Event. These releases are part of a Dutch bookcrossing challenge to release books in 2018 in 52 different municipalities. Du hast ein reisendes Buch gefunden. Dieses Buch wurde nicht verloren oder vergessen. Es wurde absichtlich "frei gelassen", damit du es findest und zum Lesen mitnimmst. Das nennt sich Bookcrossing und ist ein weltweites Netzwerk zum Tauschen, Lesen und "ln-die-Wildnis-Entlassen" von Büchern. Bitte geh auf www.bookcrossing.com und hinterlasse eine Mitteilung unter der angegebenen Nummer (BCID). So erfahren frühere Leser wohin die Reise dieses Buches führte. Das ist kostenlos und anonym. Nach dem Lesen bitte das Buch weitergeben oder wieder freilassen. Viel Freude mit dem Buch!